There is nothing better than catching fish with friends and there is no better rig to do it in than the NRS Otter 142 Self-Bailing Fishing Package. The Otter 142 Self-Bailing 14' raft is a versatile design that performs better than the smaller Otter 130 raft for those long fishing excursions or multi-day trips down the river. 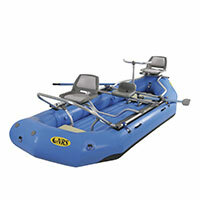 $99 Kayak, Canoe, Raft or Stand Up Paddleboard Shipping: For $99 Clavey will ship your kayak, canoe, raft or SUP to the nearest Distribution Center of the shipping company. Typically this will be in the nearest large metropolitan center to your home.